Metal roofing systems offer durability and longevity that many other roofing systems cannot provide. We install standing seam metal roofs as well as screw down corrugated metal roofs on commercial and residential properties. Metal roofing system warranties can range from 10-25 years depending on the type of roofing system. Metal roofs can be installed in new construction or retrofit over existing roofing systems to provide excellent long-term protection. Asphalt shingles may be the standard for residential roofing in Dayton, but metal roofing is a better investment. Residential metal roofing systems can last 60 years or longer with very little maintenance. With a lifespan that exceeds asphalt by four times and few repairs needed, metal roofing is a clear choice despite its higher upfront cost. Not all roofing contractors install metal roofs in Ohio and even fewer do the job correctly. We have dedicated a large part of our business to metal roofing systems with the training and hands-on experience needed for a job done well. Our metal roofing contractors install all styles and types of metal roofs. Here are some of your options. Metal roofing in Dayton, Ohio comes in many styles. The most popular type of roof is the standing seam metal roof. This choice is perfect for residential metal roofing as it achieves an elegant appearance that complements most home styles. Corrugated metal roofs are also available, but they are typically used for commercial properties. If you like the look of asphalt shingles, wood shakes, or tile roofs, you can achieve this style with metal. Metal roofs can also be installed with a tile, slate, shake, or shingle profile. This choice creates a very traditional look when you choose an earth-toned color. If you choose the slate profile, you can choose between scalloped, flat, and diamond metal tiles. ALUMINUM: which is lightweight and never rusts. The downside is aluminum costs more than steel. GALVANIZED STEEL: a popular option available in all roofing profiles like standing seam. Galvanized steel is affordable and durable, but it doesn’t have the longer lifespan of some options. GALVALUME STEEL: an iron/carbon alloy that is resistant to corrosion and cost-effective. COPPER: a premium choice that produces a beautiful patina over time. Copper roofs can last 100 years or more. Forget about unsightly commercial-grade roofing. Today’s metal roofing systems come in a huge variety of colors. You may opt for a traditional color like an earthy brown or tan to resemble asphalt or you can choose an eye-catching shade of red or blue. Corrugated metal roofing, also called sheet metal roofing, is the classic style of metal roof. This style is very common on older shacks and barns, but corrugated sheets of metal today are usually galvanized for commercial use. Unlike standing seam metal roofing, a corrugated roof is made from large panels of metal that overlap with exposed fasteners. These fasteners are driven through sections of overlapping sheets and into the roof deck. A corrugated metal roof is a good choice if you want a classic or historical style for your business. This is the most cost-effective type of metal roofing that offers many benefits. While it won’t last as long as a standing seam metal roof, it does offer excellent durability, water resistance, and aesthetic appeal. Our metal roofing contractors install all types of sheet metal roofing, including stylized panels to achieve the look you want. The standing seam metal roof is the most recognizable type of metal roofing. It features metal panels that run vertically up your roof with raised interlocking seams that join panels. Metal roofs can be used for residential and commercial roofs with dozens of styles and colors to choose from. Standing seam roofs offer the greatest level of durability and beauty with great resistance to wind uplift and water. 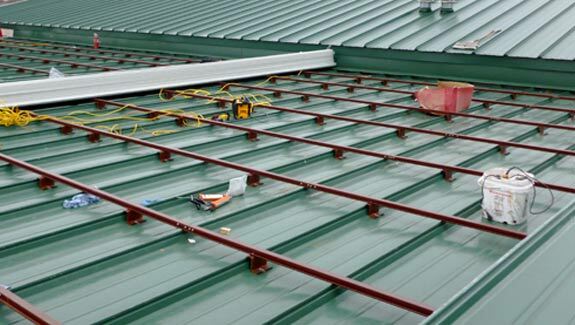 Standing seam metal roofing systems are constructed tightly for a watertight seal when properly installed. Standing seam roofs have seams that are raised above the level of the panel. This is a clear advantage as water and melting snow will run on either side of the seam with little chance of making its way underneath. The panels will also run from the top of the roof to the very bottom without interruption. There are no horizontal seams and fewer seams total on the roof for even greater protection from the elements. The biggest advantage of a standing seam metal roof is the seam itself. With any type of roof, the seam will be the weak point. This is where leaks will develop and cause damage. With straight, smooth lines and a solid color, a standing seam metal roof can give your home a somewhat industrial yet modern style. This type of roof works very well with country and contemporary homes, but it can be used on virtually any type of home. One of the biggest perks of a metal roof is it will continue to perform well for decades with very little care. This is especially true with standing seam roofs due to their unique raised seam design. Still, your metal roof may require occasional repairs and it should be inspected regularly to make sure there are no problems. Most metal roof leaks occur along flashing and they tend to be caused by improper installation. If your metal roof is leaking, we will pinpoint the precise location of the leak with unique technology. A sealant may be applied under the panels, which does require temporarily removing the panel. We also perform other types of metal roof repair. After a severe storm, usually involving large hail, the surface of your roof can be damaged. We can apply a coating to stop rust. We can also repair damaged panels with a fiber membrane that restores the integrity and appearance of your roof. We believe metal roofs will only become more common across Ohio in the years to come as prices decline and more consumers see the real benefits that metal has to offer. Not sure if a metal roof is right for you? Curious about the cost or options? We’re here to help! Here are a few common questions we receive. We are just a call away if you have a more specific question or you want a quote on metal roof installation. Yes, you can expect to pay more for metal roof installation than you would for an asphalt shingle roof. Standing seam metal roofs cost on average $9 to 12 per square foot. Metal shingles are a bit more affordable at $9 to $10 per square foot. The least expensive option is a corrugated metal roof, which may cost between $3 and $6 per square foot. By comparison, asphalt shingles cost around $3.50 to $5 per square foot. a lifespan up to 4 times longer than asphalt. For many homeowners, the higher initial cost is worth it for vastly better durability and reliability. If you plan to stay in your home, a metal roof is a smart investment that will save you the cost of another roof replacement later. What is the advantage of having a metal roof? Homeowners and business owners can enjoy many benefits with a metal roof. Most roofing systems require seasonal maintenance and repairs, especially after the first decade. A metal roof eliminates most upkeep with very little maintenance or work necessary. Your roof will also last longer than almost any other roofing system. The typical metal roof will last for 50 or more years and cost less than an asphalt roof over its life. There are other perks that come with a metal roof. Light or dark metal can insulate your home in the winter and reflect UV rays in the summer. This can reduce your energy costs by around 15%. A metal roof will not be damaged by heat or sun and offers excellent protection against fire and roof collapse. It will also hold up well against high winds. When you choose a metal roof, you are making an environmentally friendly choice. 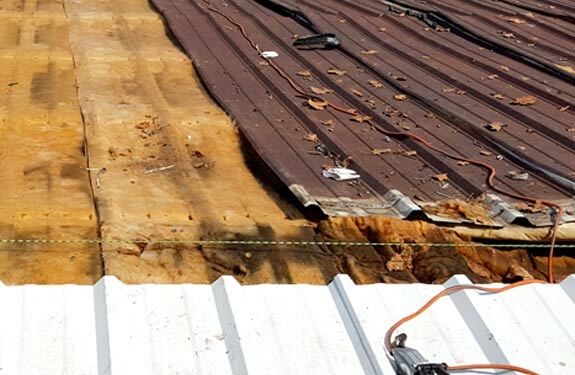 The roof can last a lifetime and be recycled completely when it wears out. Standard roof systems like asphalt shingles, by comparison, add 20 billion tons of waste annually to landfills. The longevity of a metal roof depends on the type of system you choose. Corrugated metal roofing can last 25 to 60 years. Most standing seam metal roofs last for 50 years or longer. If you choose a premium metal like copper, your roof can last more than a century.